Wireless Car Charger for iPhone X,iPhone 8,iPhone 8 Plus and Samsung Galaxy S8,S8+/ Plus,S7 Edge,S7,S6 Edge Plus,Note 5/8,ect. For best performance, remove the protective cover and place the device in the correct position of the wireless charger. 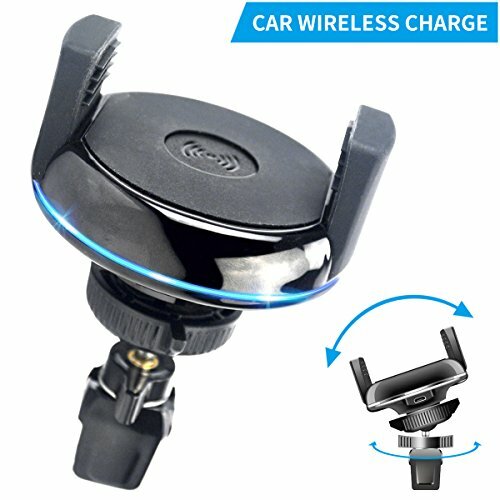 Safer Advantages - This universal car wireless charger support for the devices that bring Qi function (not support PMA receiver) or that add a Qi receiver patch. It's capable of Intelligent Identification, and that overvoltage, undervoltag, overheat, surge protection and short circuits protections to offer a safer and faster charging for your smartphone (not support tablets). Easy to Use - Connect wireless charging pad with power source via QC 2.0 AC adapter or above (NOT INCLUDED) - Check if the charging Micro USB cable connects with Wireless Charger Pad Stably - Site phone on the center port of charging stand. The charger indicator is in blue color during working. NOTE: That Charging With Phone Case (Especially Thicker One) On May influence The Charging Speed or Even Result in Charging Intermittently or Discontinued or Serious Heat Problems. Sleek Design - Delicate appearance item with PC shell material, Silicone arm and back pad protects the phone from slipping, not falling, Circular distribution LED indicator ensure charging use simple convenient. Come with 1.6ft accessories USB thick wire cable can withstand the max current 2A, so it transports current safer. You Will Get - Wireless Charger, 1.6ft fast charging Micro USB cable （adapter not included), Specification. Free Warranty + 60 days refund guarantee for any product issue friendly and easy to access customer support. Our quality products and intimate service are willing to accompany your life. If you have any questions about this product by CC-Show, contact us by completing and submitting the form below. If you are looking for a specif part number, please include it with your message.